Whether you’re managing an office, a retail outlet, or an entertainment venue, an intruder alarm should always be at the centre of security systems for London. A recent study carried out by Which? And the Metropolitan Police asked ex-burglars what they considered the biggest deterrent when staking out victims; they responded clearly that businesses with professionally installed intruder alarms in London were likely to put them off attempting a burglary on their premises. When advising clients on security systems in London, we always take into account the environment in which the business is situated. The cheapest option when securing yourpremises is to have a ‘bells only’ alarm installed. This is triggered by unlawful entry, and it creates a loud noise, but effective response is dependent upon neighbours, or the owner hearing the alarm and alerting the police. The ‘bells only’ option works well if you live on the premises, or if your business is located in a largely residential neighbourhood. For many London businesses, this is not an option, simply because the location is made up of similar business and is therefore deserted overnight. When advising on intruder alarm security in London, the 1St Choice Security Systems team will normally suggest a monitored alarm system, connected to an ARC, or Alarm Receiving Centre. The advantage of fitting this system is that your security is professionally outsourced once you leave the building, which means that you can take time away from your place of work knowing that you are leaving it in safe hands. You can choose to have your ARC contact the key-holder in case of the alarm going off, or the police. If you opt for a police response, you will need proof that your intruder alarm security in London has been fitted by an approved alarm company. 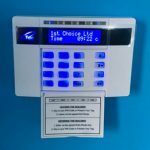 1st Choice Security Systems is an approved installer for intruder alarms in London, and our experienced security systems in London advisers can offer detailed advice on the kind of alarm which would suit your business best. Our commercial intruder alarms for London are designed to provide commercial business clients with peace of mind – and a good night’s sleep! If you’re looking for Intruder Alarms in London, or even looking for some advice before moving forward, why not contact 1st Choice Security Systems to discuss your requirements further.